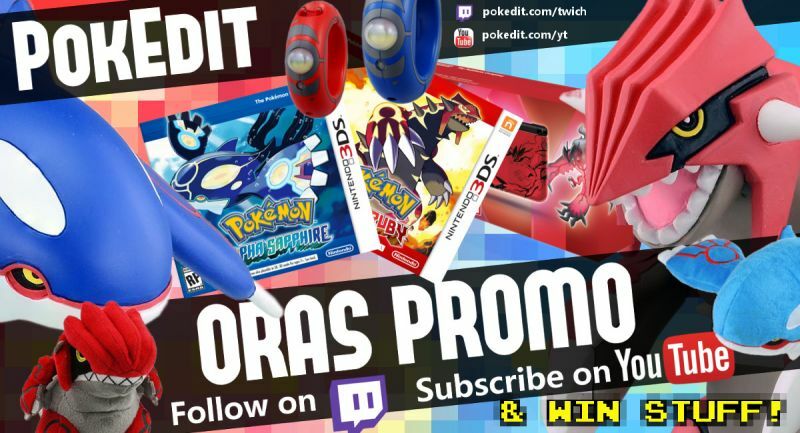 PokEdit is having a big promotion to celebrate the launch of ORAS and PokEdit 2.0. We're going to be giving out a bunch of free prizes includes Omega Ruby/Alpha Sapphire games, 3DS XL console, plushies, figures, and way way way more! This is actually 5 separate promotion lumped into one huge promotion. It's super easy and free to enter all of them. Here is how each promo works. 1. Follow us on Twitch, watch the live stream, win prizes! 2. Subscribe to us on Youtube, watch the live stream, win prizes! 3. Like us on Facebook, repost our promo post, entered to win a prize! 4. Follow us on Twitter, retweet our promo post, entered to win a prize! 5. Follow us on Tumblr, reglog our promo post, entered to win a prize! The Twitch and Youtube promotions are the main ones. There will be a bunch of prizes given out every day during the streams! Remember, you must follow, subscribe, and everything BEFORE the drawings or you will not be entered into them! The plush does sound nice actually. The Plushies are amazing. I'll be showing off the prizes on stream and with pics in a couple days. I really hope not to miss all of it. my work day ends where you stream begins tomorrow. Tomorrow's stream isn't included in this promo. But we'll talk about the promo and probably show off some of the prizes. Cool. It's always good to have some views for the PokEdit Weekly. Will you be able to mod? if I can make that date, then yes. alrighty. I'll just see who's online 10-20 minutes before the stream goes live. Ron will be helping me tomorrow too, so it might not be a big deal. whoa... whoa... slow down. you've never heard of it? pretty much EVERYONE who's been around the internet (or around 4chan. there was a war between the 2 awhile back.) knows about that site. Just make it everyone. Everyone knows about it. Subcribed on youtube and shared on facebook. Note here: A note from me personally. Please don't assume everyone knows about something. Even if it's very popular, that expectation is very unrealistic. Didn't say it was. It really isn't. Simply my own opinion. As individuals, we have a choice. You can agree or disagree. I chose to defend what I believe in, no matter how miniscule the matter may seem. That it shouldn't be expected of anyone to know what anything is, popular or not. Knowledge is an ongoing thing. There is still much we don't know. It's like telling a child about space and someone freaking out over how they don't know about it. [Child: I didn't know..] It can really hurt someone's feelings or stir them emotionally. I'm not forcing my opinion on anyone, I'm merely stating it. You're a deep thinker? Wouldn't have guessed xD I agree with you, but I won't deny that if people don't know about certain things, I will completely lose my mind. already lost mine, abe. if that counts for something. Guess people react differently to people not knowing things. Usually I'm just like "Eh, OK" and explain it to them. Wait, how did you lose a tooth and that much blood? AND THEN MILTANK WAS A ZOMBIE!!! Pokedit is offline. Any idea when it will come back up? If you mean GTS, it will NEVER BE BACK ONLINE. Not the right place for this. Since the promo is finished this topic will now be closed.